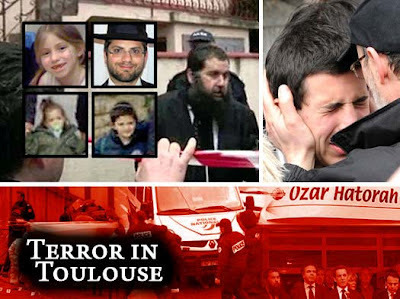 JooTube.TV: Anti-Semitic massacre at Toulouse school; Can Muslims in the West be relied upon to rid the hostility from their culture? Are humanist Jews exploited by CAIR claims of NYPD's "Islamophobia"? Anti-Semitic massacre at Toulouse school; Can Muslims in the West be relied upon to rid the hostility from their culture? Are humanist Jews exploited by CAIR claims of NYPD's "Islamophobia"? Rabbi Jonathan Sandler of Kiryat Yovel, his two young sons and the young daughter of the principal of the Otzar HaTorah Jewish day school in Toulouse were gunned down by a man wearing a black helmet who had arrived at the school on a black motorbike. A 17-year-old boy was critically injured by the shooter, who reportedly chased children around the school. Investigators also confirmed Monday evening that they are investigating the connection between the murders of French paratroopers last week and those at the Jewish day school. Investigators of the Toulouse-murder say they're concentrating on right-wing motives of a suspect. Initial assumptions that an attack on a religious Jewish school in Toulouse, a city with an approximate 10% Muslim population, would be that the attacker would be that a Muslim has targeted Jews. In this Pew Global Attitudes Project poll released in July, 2011, ratings for Jews are uniformly low in the predominantly Muslim nations surveyed -- in all seven of these nations, less than 10% have a positive opinion of Jews. Indeed, outside of Indonesia, less than 5% offer a positive opinion. The Parisian synagogue threats also stand a fair chance of being similarly motivated. SunTV of Canada's Michael Coren alleges here that the murders were Islamist-motivated. But when the NYC Police Department was revealed to have been educating its officers in counter-terror ideology with reference to supremacist elements within Islam, Council for American-Islamic Relations (C.A.I.R.) charged the NYPD- with being "Islamophobic," that is, not the literal phobia/"fear" of Islam, but a prejudice against Islam. Rabbi Gerald Meister has declared that given the hostility and terror against non-Muslims manifested in the name of Islam, fear of Islam or true Islamophobia is a healthy reaction of self-preservation. He spoke last month in Nashville about Islamo-fascism as the Muslim holy-war against the G-d of the Jews. NYC Rabbi Marc Schneier, co-founder of the Foundation For Ethnic Understanding (which fosters “twinning” programs between mosques and synagogues), took the opportunity to organize a gathering of support of Jews and Christians opposing the NYPD's perceived prejudice against Islam or "Islamophobia." Hindu and Jewish protestors denounced Jewish Community Center (JCC) of Manhattan hosting "Combating Islamophobia" symposium in the wake of Muslim chastising of NYPD for teaching ideology behind Islamist terrorism. Speaking about the recent controversy that has swirled around New York City Police Commissioner Ray Kelly for authorizing police surveillance of mosques in the New York area and for using the documentary entitled “The Third Jihad” as a training tool for his department - protestor Marion Dreyfus addressed the gathering passionately. “Commissioner Kelly is defending us. He should not be castigated. He should be admired and supported,” Dreyfus remarked. The panelists of the program, moderated by former first daughter, Chelsea Clinton, included Rabbi Marc Schneier, co-founder of the Foundation For Ethnic Understanding (which fosters “twinning” programs between mosques and synagogues) and Imam Shamsi-Ali, the spiritual leader of the Islamic Cultural Center of New York and the chairman of the Al-Hikmah mosque in Astoria. Mrs. Helen Freedman, the executive director of Americans For a Safe Israel (AFSI), said, “The JCC, in sponsoring ‘Combating Islamophobia’, is suggesting that it is un-American to fear Islam. Our liberal upbringing causes us to be offended by the accusation that we are racist when it comes to Islam, but isn't there ample justification for concern about a political agenda disguised as a religion which promotes hatred of non-Muslims and women?" Mrs. Freedman spoke with JooTube about Jewish-Muslim relations, too-forthcoming Jewish apologism for non-Jewish Islamophobia, and whether the Muslim community is doing enough public, self-policing of radicalism, anti-Semitism, and anti-Israelism to justify the bonhomie of Jews.